Did you know that your shampoo and other personal care products might contain dangerous chemicals that build up in our rivers and watersheds? The PA Sea Grant program strives to reveal these hidden threats to our water to the public in order to protect one of our most precious resources. The PA Sea Grant (PASG) is a program that focuses on the health of the Lake Erie, the Delaware River and Susquehanna River watersheds in Pennsylvania. Because Lake Erie is affected by many different watersheds, PASG collaborates with many other cities and townships to promote the ecological and economic sustainability of Pennsylvania's coastal resources. They even coordinate with different states and countries to achieve a lasting and permanent change. The PASG staff uses a science-based research, outreach, and education program to increase citizens' awareness, with the hope that in turn they will share it with others and exponentially increase the impact of their programs. PA Sea Grants outreach programs have been doggedly working to heal the Lake Erie Watershed and their efforts have lead to many partnerships and initiatives in our local community. One of PASG's major education projects is their collaboration with the Erie Times-News Newspapers in Education (NIE) program. Each Tuesday, McCartney provides articles and illustrations for the "NIE Reconnect with your Environment" page. This weekly publication covers a variety of topics from the effects of plastic debris to what causes harmful algal blooms. The pages can be found either in classified section of the Tuesday Erie Times-News, or on PA Sea Grant webpage. If you are a teacher, you can get free copies of the Tuesday newspaper sponsored by a grant from the PA Coastal Resources Management Program for your students to use as a resource in your classroom and PASG provides helpful lesson plans for using the NIE. Go to http://nie.goerie.com/ to order your newspapers or use the PA Sea Grant webpage to access past pages and lessons. PASG also holds numerous conferences and presentations throughout the year. You can find many of their talks free and open to the public through our events page and monthly newsletter. Sea Grant's awareness-raising presentations have already had a lasting impact on our local community. After a PSAG Presentation in a Mercyhurst University organizational leadership sustainability studies course taught by Dr. Anne Zaphiris, the students were so moved that they created a campaign they call "Fresh Face Forward" to continue to raise awareness on campus about harmful chemicals in shampoo and other products and their effects upon our water and marine life. The Fresh Face Forward team has partnered with Sea Grant to conduct a year-long social campaign to help students learn about the "Toxic 15" chemicals including formaldehyde, one of the most common chemicals found in shampoo and other products. Before cities replaced natural ground with impervious surfaces, about 55% of the rain water was absorbed into the ground. Today, in some areas only about 5-10% of the water is absorbed and most becomes runoff. This runoff water picks up harmful chemicals from the roads and sidewalks, carrying them into the streams towards the lake where they accumulate. The PA Sea Grant has been working to get the community to install rain gardens. Many rain gardens have already been created all around the city including one at Urban Engineers on Sassafras Street and another at St. George Elementary School on Peach Street. Finally, the PA Sea Grant works to stay abreast of the newest developments on the lake and watersheds by supporting ongoing research. Not only do they do their own research, but they also help collaborate with and fund other research groups. 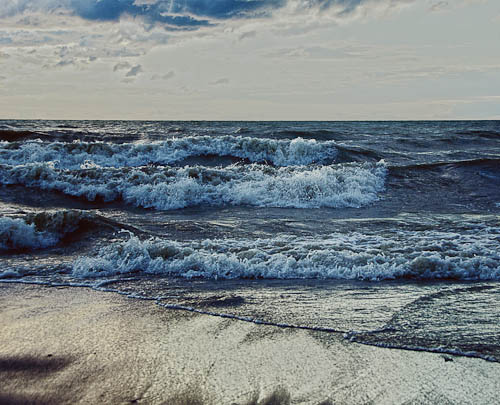 Examples of their recent research includes the impact of climate change on aggressive non-native species and evaluation of the quality of the sediment at the bottom of the Lake Erie. Both of these research opportunities contribute to the overall health in concrete ways. Invasive (aggressive non-native) Species of animals can and do destroy the natural ecosystems of a Lake. The monitoring of sediment in the Lake helps limit the amount of harmful chemicals that enter Lake Erie. This in turn reduces the damage to the fish of the Lake. Photo courtesy of Karen Coughlin. Give the Pennsylvania Sea Grant website a look! Check out their weekly newspaper page in the Erie Times-News Tuesday edition and "like" them on Facebook.